Born May 27, 1940 in Aberdeen, Scotland. Bill started playing soccer in 1947 for St. Margaret’s Episcopal School and Old Aberdeen Public School. In 1955 he was chosen to the All-City Select Team and North of Scotland Juvenile Select Team. In the Early 1960s he played with a variety of Scottish junior clubs. He moved to the United States in 1964 and joined the BYU Soccer Club. He traveled with S.C. Alemannia to Germany and with Hollandia S.C. to the Netherlands in the late 60s, and during this time was named MVP for the Utah Soccer Association, including being a member of the Association’s All-Star Team for several years. Bill was part of the BYU team that won the 1970 Daynes Challenge Cup. In 1971 and 1972 he also played for S.C. United and Hellas S.C., and started the Murray High School soccer program, which he coached for 30 years. In 1973 the Murray Soccer Club was also founded by Bill, for which he played and coached. 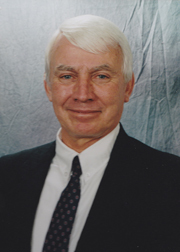 In 1982, his active role in bringing the acceptance of soccer in the Utah High School Activities Association had a large impact on the development of the game. He continued to play throughout his life and joined the Salt Lake S.C. in 1985, playing soccer into his 60s.